How did Calvary Commission end up with an orphanage, a distribution center, an outreach ministry, and a thriving church in Reynosa, Mexico? "Joe, I want to turn this ministry over to you and Calvary Commission." Keith was quite a visionary. He said," I have a vision of a three story building that would be a center for the whole southern hemisphere. I will help you raise the money for it." I told Keith that night that I was sorry, but we were just too small a ministry to take on such a project at the time. He went away disappointed. He said that he thought he had really heard from God about giving the ministry to us. The next morning I awoke at 5:45 am and while laying in bed I heard the Lord say, "Do it." I went to Last Days and told Keith that we would send a team to Hidalgo, Texas, and the next morning I was on a plane to the interior of Mexico to bring back workers to start the new base at the border of the United States and Mexico. The friends from Last Days Ministry responded to Keith's cry for help and truckloads of blankets, food, toys, and clothes began flowing in. We had to rent an additional warehouse and we calculate that our present method of distribution, it would take 6 years to give it all away.When the temporary warehouse had to be vacated, we began to send packed 18 wheelers up to other ministries and all the gifts from our friends got into the hands of needy people. As we gave to the poor and needy, we also told them about the Greatest Gift, Jesus Christ. So a new church was forming and we saw Reynosa, Mexico as a mighty reachable missions field. The very next year on July 28, 1982, I rushed to Last Days Ministry upon hearing the news of a plane crash. I asked if anyone knew who was on the plane. "Not really'" was the reply. I said, "Keith wasn't on it, was he?" "Yes, Joe, Keith was on it." I was crushed. And two of his children were with him. Why? Why would 12 people die so quick? Why did it have to be a flaming crash? What would happen to Last Days Ministry? What about Keith's vision for Mexico? A few weeks later, Melody Green called me and told me that a memorial fund had been set up for the children. She said that she wanted to designate it to help the children of Mexico. Josiah, who had perished in the crash, had been with Keith and Melody on their trip to Mexico. She said that after coming home, he would pray for the people without houses. 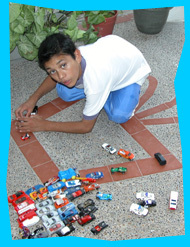 As we worked on the streets of Reynosa, we found street children who were in such need of God's love. We began to feed them and yet it was so hard to have them return to the streets. We finally said, "We've got to help them." We rented a house and started our Calvary Commission family in Reynosa. With many miracles we were able to build a three story building debt free. We named it the Josiah and Bethany Children's Home. Today we have our Calvary Commission Church, a pastor's apartment, our kitchen and offices on the first floor. The Josiah and Bethany Children's home is on the upper two floors. We even use the roof.